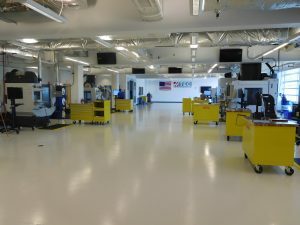 PPA evaluator Michael J. Polzin, Ed.D., conducted a case study of Danville Community College’s (DCC) Retooling America initiative, a highly innovative Integrated Machining Technology program that engages students in a real-life work flow cell experience as part of its curriculum. Funded by a Trade Adjustment Assistance and Community College Career Training (TAACCCT) grant from the U.S. Department of Labor, Retooling America was developed with deep employer input and in response to significant employer needs for workers with advanced precision machining skills. Agreements with local technical high schools and other community colleges have enabled the development of a talent pipeline that is a key factor in attracting new manufacturers to the region, further enhancing the need for skilled workers. PPA is the third-party evaluator of this project, now in its final year of grant-funded activity.